This question wasn't difficult in the least, just kind of fun - and great because I got to give a patron very good news. On Friday, a patron called in and asked if I could go to the website of Skinner auction house. He said he had an item that was included in their auction that day, and wanted to see how much it sold for. Finding the website was no problem, but it took me a little while to find the right auction results. The auction went from noon to 4pm, and the patron called about 2:30. So, although I found the auction results, it turned out his item hadn't come up yet. We did learn that his item was estimated to sell for between $1,200-1,800, which sounded good. He thanked me and said he'd call back in a little bit. About 4:30 he called back, thinking that since the auction ended at 4pm, all the results would be posted. But they weren't - they were still only about halfway through, and his lot was towards the end. I told him we were open until 5:30, and he's welcome to call back, or I could keep checking and call him. But, he said he was leaving for the day, so he'd just stop in the next morning. It was my Saturday to work, so I was at the desk when he came in right at 9:30. I think we were both kind of excited as we went back to the website and looked up the auction results. Everything had been posted by then, so we scrolled down to his lot number to see how it did. Amazing: $4,148. The patron was astonished, and had to ask me a couple times if that was the actual sale value. We doubled-checked by looking at the individual item listing, and sure enough, his painting sold for $4,148. However, because of Skinner's 15% commission, he'll only receive $3,500, but he still had a big smile on his face as he walked away from the desk. Wow, what a nice way to start a weekend. This year while we were compiling all of my library's FY11 statistics to report to the state, it occurred to me to try something new with them. Since everything we tally up for the state report is how much each library service get used, I thought I'd put all those totals into the Library Use Value Calculator - this then, in theory, will show how much value the entire community gets from using the library (instead of just using the calculator on an individual level). So at retail prices, the entirety of our activity last fiscal year should have cost our patrons a staggering $12,371,068.30 - over twelve million dollars. The library's total budget is about $1.5 million. So, by funding and using the library, our community saves about $10.5 million dollars a year. I think that pretty clearly spells out the value of public libraries. Hopefully we'll be able to work this into some marketing materials to make the case of why our (meager) budget is important to the community. Can you tell me how many silver dimes it takes to make an ounce of silver? I said sure, and started an internet search. Initially I searched for "silver dimes in an ounce site:.gov" hoping that a Government site would have the most authoratative information on the different metal composition of different coins, and provide a nice chart to equate silver coins to pure silver ounce. But after skimming the first couple pages of results, I was getting nowhere fast. I dropped the "site:.gov," which produced a ton of results - by comparing various answers, which were all roughly the same, I felt confident to give her the answer that it takes 14 dimes make an ounce of silver. Thank you, that's wonderful. If it's not too much trouble, could you also tell me how many silver quarters make an ounce? You see, my husband always kept a jar of silver coins, and he told me never to touch them. He said the silver in them was worth more than the coins, so to never spend them. I heard that the price of silver is getting high now, and with my husband gone, I wanted to know if it was time to cash them in. I ran the same search for quarters (6 quarters) and also for nickels (18 nickels - I did not know that nickels minted during WWII were made of silver). While I was looking for these, the woman kept talking about her husband, and why he collected coins. He always said that you can't lose with coins, because you have options. He said the value of the silver in them will always be the highest. But, there's also the value to coin collectors if you have something rare. And, if all else fails, at least you can still spend them as dimes and quarters. You can buy a block of silver, but you can't spend it at a store - at least you'll always be able to spend coins in a pinch. This whole call had an air of sorrow to it, because I got the feeling that her husband had died awhile ago, and she had hung on to these coins with that memory of him. But with her investigating the value of the silver, it felt as if she was ready to cash out because she needed the money - and the thought of an elderly woman taking a mason jar full of her late husband's coin collection to a cash-for-gold place just made me sad. Well, that's either $1.40 in dimes or $1.50 in quarters - I've got a lot more dimes anyway, so I'm going to turn in enough to buy myself something nice. This'll be the best $1.40 I ever spent. Ha - that brightened my entire day. After I hung up with her, I kept searching to see what else I could find. Coinflation.com offers some good tools - a handy listing of the face value and silver value of circulated coins (which also links to individual pages about each type of coin), and a silver coin calculator in which you enter the number of different types of coins and it tells you how much they are worth. Some people might remember that one of my hobbies is metal detecting (fitting for a reference librarian, right?) - it turns out that the four Mercury dimes I've found are worth $13.87 in silver. Neat (but I'm keeping them). This post isn't about the current ebook debacle, because Bobbi and Kate are doing a better job than I could. I also wanted to add a "Share on Facebook" link, but I haven't tackled that yet. If anyone is looking for a project, let me know. All of this is available at http://www.swissarmylibrarian.net/librarycalculator. 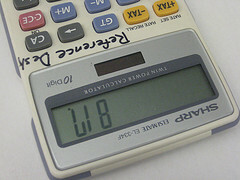 If you already had the calculator embedded in your library website, the updates will take effect automatically. If anyone has any questions, or needs help with the calculator, please let me know. This week's question is actually one I needed to answer myself - it's a little bit random, so bear with me. My library just held our annual thank-you dinner for all of our adult volunteers. To illustrate "the value of volunteers" (in other words, how much money volunteers save us) my director and I came up with a "volunteer stats" bookmark* [ppt, 1.2MB] to hand out. We had 241 volunteers last year, with a total of 5804 volunteer hours. We figured if we paid them each $15/hour, their labor would have cost the library $87,060. Just to add another little fact to the bookmark, I wanted to figure out just how tall $87,060 was in $100 bills. So of course, I turned to the internet. I did a search for something like how tall is a stack of money, and after clicking on a few results, I found a forum posting that provided the Excel formulas needed to calculate not just the height of a stack of bills, but also the cubic volume and value of different denominations. Neat. I copy/pasted the formulas into an Excel spreadsheet* [xls], and after a little tweaking, had my answer. And just to double-check it, I went back to the internet to find a "known value" (in this case, the height of $1 million in $100's). It checked out, so I had my fact for the bookmark, and a job well done, right? Well, not so fast: being me, I thought, "hey, wouldn't it be awesome to turn this Excel spreadsheet into a web form that other people could play with? After all, that was so popular the last time." And it turns out, there is: I found SpreadsheetConverter.com, which does exactly that. After you download the software, it converts spreadsheets to a web-ready format with just a click of a button - pretty neat. But even better was their free demo offer, where you email them your spreadsheet and they convert it for you. Within 24 hours they sent back the converted webpage, and it works great - just enter the height** of your money stack below, and the spreadsheet tells you the value of various denominations, for both a single stack and a cubic block of bills. One condition of the free demo is that it is for evaluation purposes only, so evaluate away and keep this tool in mind if you ever need to throw a spreadsheet up on your website - it can save you a lot of time. Too bad I didn't know about it when I was coding the Library Use Value Calculator. The thank-you dinner went well, and the bookmarks were a big hit. Yay for volunteers. *Feel free to download, edit and reuse our volunteer bookmark* [ppt, 1.2MB] or the Excel spreadsheet* [xls] if you like.